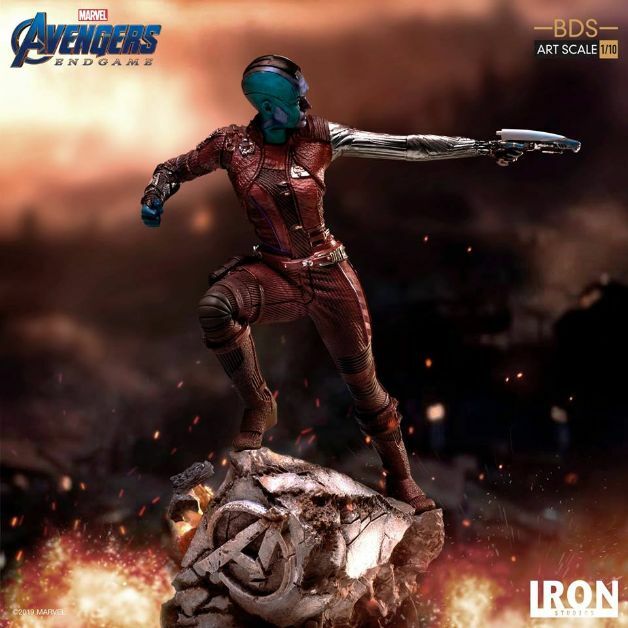 A new Nebula model from Iron Studios has fans all the more convinced that Avengers: Endgame will feature an attack on the HQ of Earth’s Mightiest Heroes. As you can see below, Thanos’ adopted daughter is pictured against the backdrop of a devastated landscape, much like the one witnessed in the film’s various promotional footage. But the part that’s got the internet talking right now is the big stone block that Nebula is stood on. With the Avengers logo displayed on the front, it looks this structure could’ve broken off the team’s base during battle. It’s an interesting find, though we’ve certainly seen more convincing evidence to suggest that the Avengers Compound will come under attack. A new LEGO set, for instance, is entirely based around the scenario of Thanos and his minions clashing with various heroes at the headquarters. And in a similar case to the Nebula model, a recent line of Diamond Select toys shows the Mad Titan and several heroes stood on different pieces of rubble, including a shattered Avengers logo. Meanwhile, the Endgame trailer released last month contains a shot that seemingly shows an explosion blooming on the compound behind Scott Lang. Later on in the preview, there’s even a short clip of a shrunk-down Ant-Man navigating the wreckage of an office environment. Regardless, the new Nebula model also gives us another opportunity to look at the latest design for the Guardians of the Galaxy regular. One thing you can’t see in the above image, however, is the left side of her face, which previous pics suggest will have orange or brown implants in the new film. Could Karen Gillan’s character be about to undergo another upgrade? We’ll find out when Avengers: Endgame hits theaters on April 26th.